All the men here have two things in common: their homosexuality and their deep love for sailing. It’s a rainy Thanksgiving night in Brooklyn, and a friend has invited me into the home of strangers for supper. Laid out on the kitchen table is a spread of bacon-wrapped squash, honey-baked ham, turkey, green beans, brussels sprouts, and all the fixings. In the living room a dozen men are seated in a circle on sofas and folding chairs, plates neatly placed squarely on their laps. Curiosity strikes their faces when one of them rises to his feet. “I think he’s choking,” says one guest, a doctor, who looks across the room at his boyfriend, also a doctor, who returns the look with a shrug. The choking victim is our host, and he’s stumbled into the middle of the circle with his face switching patriotically from red to blue to white. “Yeah, he’s definitely choking,” says another guest. All the men here have two things in common: their homosexuality and their deep love for sailing. They’ve crossed land and sea, traveling from their houseboats — anchored in New Jersey or Long Island — or their Manhattan apartments, to be together for the holiday. One person is missing. A great cannonball of a man, who was carving the bird in the kitchen with one hand and holding his lap dog with the other, has picked up on the bother in the adjoining room. He crooks his neck around the corner, tosses the dog and the carving knife, and barrels through the hallway. He thrusts the host’s head toward the ground, and, with a great, flat-palmed whack between the shoulder blades, a brussels sprout launches from the host’s mouth onto the floor, where our hero’s lap dog scuttles over and devours it. “Happy Thanksgiving, Dingy,” says the host to the dog through gasps and coughs, the dog still licking up the gooey spot on the carpet. Uncomfortable laughter and a golf clap cut the tension. The host will live, and he takes his seat. “Why didn’t you use the Heimlich?” asks one guest. “No one uses the Heimlich anymore,” says the flight attendant. “It’s outdated.” The doctors nod. This is my unofficial introduction to a handful of the roughly 150 members of the Knickerbocker Sailing Association, a gay sailing club serving the New York metropolitan area. Gay sailing clubs proliferate around the globe, and there are two other clubs, Boston’s Yankee Cruising Club and the Open Seas Yacht Club in Annapolis, Md., on the Eastern seaboard. What makes Knickerbocker different, members say, is the club’s openness and egalitarian approach to membership. The club consists mostly of crew, rather than being mostly or exclusively made up of boat owners. It welcomes different types of sailors, too: those who go out for leisure and those who race. Its members also span ages, economic backgrounds, sexual identities, and race — sort of. One effort to diversify sailing in New York City involves a nonprofit called Hudson River Community Sailing, which teaches underprivileged children how to sail, focusing on the mathematics and physics of the sport. Knickerbocker’s annual Pride weekend regatta, in which members race J/24s up the Hudson, is a fundraiser for Hudson River Community Sailing. 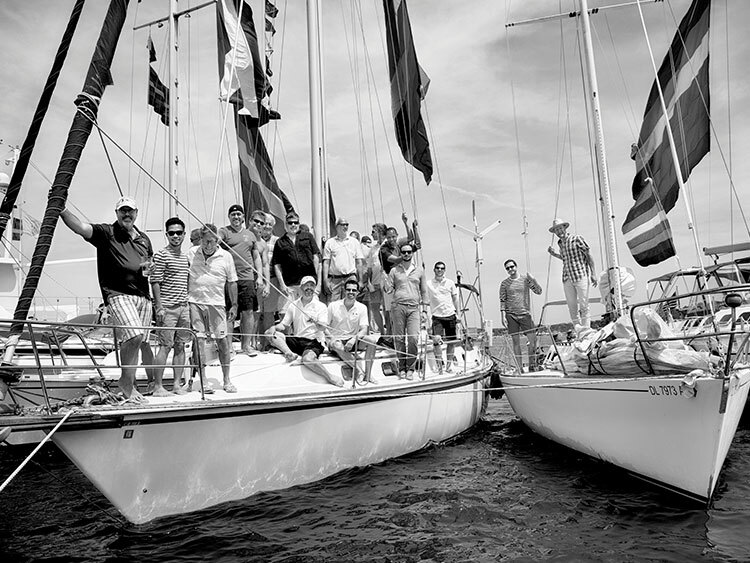 Last year, 50 Knickerbocker members competed on 10 boats, their most to date. It’s Memorial Day weekend, months after the choking incident, and I’m zooming through midtown Manhattan in a Fiat with James Weichert. We make a pit stop in Queens to pick up his friend Martin and his dog Luca, who only understands Spanish, and then we’re bound for City Island, in the Bronx, where Weichert anchors his 35-foot-long J/25 racing boat named Runaway. At the 2014 Gay Games in Cleveland, Knickerbocker placed sixth out of 13 entrants. Weichert’s most frightening moment at sea occurred several years ago. He was anchored in Rhode Island when a hurricane came through. As he pulled up the anchor, the windlass broke and his hand went through the chain. The wind was blowing 60 or 70 miles an hour. There’s no such excitement or competition for the Knickerbockers on this leisurely weekend. With Céline Dion cranked up on the speakers in the crisp, spring light, we take Runaway across Long Island Sound cruising at a comfortable six knots. With the Throgs Neck Bridge in the distance, we sail past a naval academy and then the largest potter’s field in the U.S., Hart Island, where unclaimed corpses are laid to rest. At Manhasset Bay, an inlet on the north shore of Long Island that was fictionalized as East Egg and West Egg in The Great Gatsby, the flotilla awaits; an enormous rainbow flag is hoisted high and billows in the breeze. This particular flag was donated to the group by Gilbert Baker, a former Knickerbocker member and the designer of the original rainbow flag. On shore, the cold facades of some of the nation’s most expensive homes glower back at us suspiciously. I climb onto Bill Helmers and Steve Kelley’s boat. The couple lives here year-round aboard the vessel they named the Michael Leslie, after Kelley’s brother who died in a boating accident at age 19. “Here we are in the backyard of gazillionaires, and we’re like, ‘Eh, who cares,’ ” says Helmers. While anchored in Fire Island he began knocking on doors to see if anyone had interest in joining a gay sailing club. The first year he found 12 members. For many, it seems, life on the sea is hereditary. Toan grew up sailing on the Hudson. His mother, since childhood, would sail around Lake George. His father, in adulthood, had a boat. Many in Knickerbocker, like Toan, live on their boats year-round or at least for several months of the year. “It’s just like a Manhattan apartment, in terms of space,” says Helmers. Perhaps a Tokyo apartment, or a Foxconn dormitory, might be a more accurate comparison. But, like Manhattanites, you really have to accept being crowded and on top of people all the time (one of the nice things about the gay sailing life). Each boat’s captain is responsible for the entire crew’s well-being and making sure everyone is fed and comfortable. The sailors settle down with cocktails and finger foods, but terror on the low seas encroaches. A yacht several yards away has become unanchored and is drifting slowly and ominously toward us. Helmers is the first to take notice. “I got a stinkpotter over there with no one on board that’s dragging!” he shouts. The sailors run to the bows of their crafts and begin to yell at the yacht as it ceaselessly glides their way. Kelley and another sailor hop into a dinghy and speed over to the yacht. They jump aboard — but not before the craft lurches into a Knickerbocker boat and smashes a light. An attractive young woman and a much older man come running out. It takes several minutes for the sailors to assist the yacht owner in maneuvering his boat away from the flotilla; then, once the yacht is a safe distance away, they take the dinghy back to the flotilla. Stinkpotter is a derogatory slang term for a powerboat. Knickerbocker welcomes them into the club, but not everyone approves — even though the current commodore of the club, Mark Whitman, drives a powerboat. Kapp was meant to be joined by a friend this weekend, a fellow Knickerbocker named Robert who is in the hospital. “He got crushed by a fat lady who fell on him on an escalator,” he explains, “and he’s in rehabilitation for another month.” The Knickerbockers have been sending their warm wishes and get-well-soons. For Toan and most members of Knickerbocker, and for the sailing community at large, the sport aspect of sailing is only half the appeal.